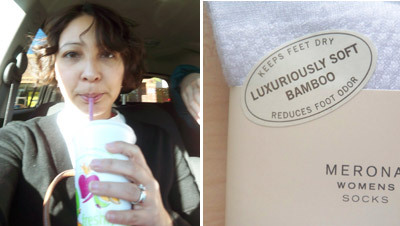 Today I had Jamba Juice and wore new socks. Today was a good day. I love, love my new socks. They are made of bamboo and they are so comfortable. 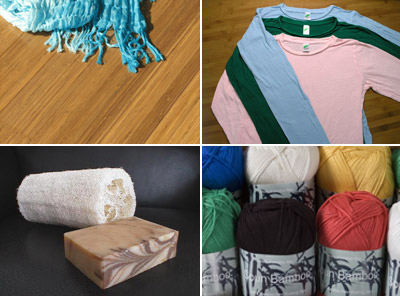 Tina thinks we should buy stock in bamboo... they are making so many things out of it, flooring, clothes, yarn... even soap. And really, really comfy socks. I read an issue of MSL over the weekend (I think it was the current one) and in the "Ask Martha" section there was a question and answer about bamboo towels. That was the first time I had heard of them - I think you and Tina are right, bamboo seems to be turning up everywhere. I bought some Bamboo sheets from target (on clearance! )this summer and they are so soft and light. All of the best socks I own are bamboo. I love them. Emily - hey! that's cool. I won't be able to color eggs before I come home for Easter since I am in San Fran... so I will see what ties I can dig up... heh heh. I also read about bamboo towels recently. They reviewed 5 brands in the Wall St. Journal. They're supposed to be softer and more absorbent than cotton - also antimicrobial. Sounds great. I think one of their top picks were the bamboo towels from lands end. I bought a pillow from Traget with bamboo. Fancy! Oh, I hope you have better luck with the Target socks than I did! I bought four pairs, and the toes were holey within a month.